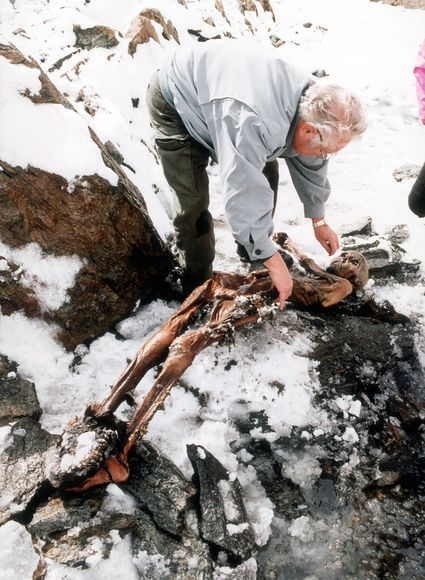 In 1991, a 5,000 year old mummy was found in the Italian Alps. 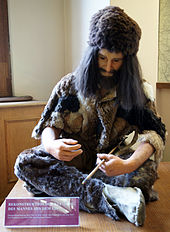 Christened “Ӧtzi”, the body had been naturally preserved because it had been covered in ice shortly after the man died. In the beginning, scientists were able to learn a lot about life in the Copper Age. They were able to learn about the clothing that he wore and the tools that he used. When his lungs were examined, it was found that they were blackened. Scientists surmised that this was because he had breathed the smoke from campfires. His skin was preserved well enough that the scientists studying the body were able to locate and document tattoos. In this case, they were found on his lumbar spine, behind his right knee and around his ankles. It was believed that they may have been related to acupuncture treatments that were intended to relieve or reduce pain. The earliest confirmed accounts of acupuncture and acupressure in China were from 2000 years later than the time when the iceman walked the earth. 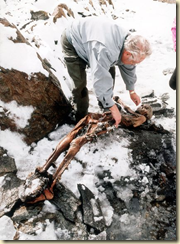 A lot of information was found regarding the iceman’s health. It is known that he suffered from a parasite known as whipworm and that he had been sick approximately three times in the six months that preceded his death. He also suffered from a number of cavities that had deteriorated his teeth prior to his death. 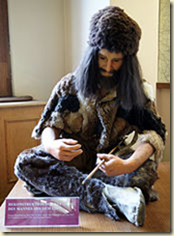 One of the most interesting pieces of information that scientists were able to learn from the Iceman’s body was what his last meal or meals were. Scientists were able to analyze the contents of his lower intestine and had found that he had eaten a meal that consisted of grains and possibly the meat of red deer and goats. They had been unable to use an endoscope to view the contents of his stomach and were unable to tell what his last meal would have been. Now scientists have been able to study Ӧtzi’s stomach contents. Scanning the body with computer assisted tomography (CAT scanning) showed that the stomach had shifted into the space that would normally be occupied by the lower part of his lungs. Scientists are unsure of exactly why the stomach shifted but were able to locate it and get a sample of its contents. It is now known that the stomach contained traces of meat and grains. The volume of the stomach contents was fairly substantial which told scientists that Ӧtzi had eaten a large meal approximately two hours before his death. They were able to separate out some larger pieces of meat and grain from the other stomach contents. Scientists are unsure of whether the meat was cooked. There was evidence of animal hairs and fly parts which suggested that the meat may not have been thoroughly cleaned before it was eaten. Scientists are unsure of why Ӧtzi was killed. They do suspect that his death may not have been from natural causes. An arrowhead had been found lodged in his left shoulder. It was believed that he may have been killed as a ritual sacrifice. The shaft of the arrowhead had been snapped off and evidence of defensive wounds and a blow to the head were also detected. Archaeologists have been given a lot of information about what the daily life of Romans was like by unearthing the Roman towns of Herculaneum and Pompeii. The two sites continue to be excavated today in order to find out what life was like approximately 2,000 years ago. 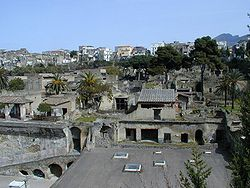 Now Herculaneum is the site of a new find that has helped answer a lot of the questions which previous digs brought up. Scientists have been able to excavate a cesspit that was located beneath the town. It has unearthed ten tones of human feces and ancient Roman garbage. The garbage came from both residential apartment blocks and from shops. It is believed that much of the garbage dates from around 79 CE. That was the year that Mount Vesuvius erupted burying both Herculaneum and Pompeii in a thick layer of volcanic ash. The cesspit was located beneath a district inhabited mainly by artisans and shop keepers. In addition to the remains of food and human waste, scientists were also able to find coins, semi-precious stones, broken lamps, pottery and lost jewelry. The cesspit measured approximately 230 feet (70 m) long, three feet (one meter) wide and seven to ten feet (two to three meters) tall. When scientists first discovered the cesspit they thought it was simply another part of the town’s drainage system. They did find, however, that the area did not have an outlet. It was then that archaeologists began studying the area in greater detail. 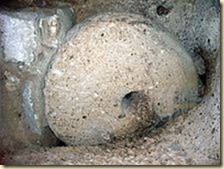 They found that by putting the mixture through a series of graded sieves that they were able to separate out objects ranging from pottery and bone fragments to the nuts and seeds that made up part of the Roman diet. From this mixture they were able to determine that the Romans who lived in Herculaneum had quite a varied diet. 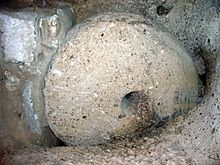 They found evidence that the Romans of Herculaneum consumed meat such as chicken and mutton, seafood such as fish, mollusks and sea urchins and other foods such s fennel, figs and olives. Scientists are also hoping that they will be able to find microscopic evidence of disease or to be able to find microscopic evidence of parasites that may have affected the people of Herculaneum. Herculaneum has been a rich source of archaeological information simply because the town and its residents were well preserved by the fast moving mixture of ashes and hot gas. Remains were well preserved because the layer of ashes was so thick. It created an air tight seal which was not broken until 1738 CE. It is a valuable archaeological site as it is one of the only areas where Roman bodies were found. It was difficult for archaeologists to find evidence of Roman bodies anywhere else as cremation was a popular way of disposing of dead bodies. While Herculaneum did give archaeologists a lot of information about ancient Roman life it has been largely unexcavated. This was because archaeologists preferred the Pompeii site as it was much easier to find bodies and excavate the city. Turkey is home to some of the most interesting archaeological digs around. One of the most intriguing would have to be the underground city at Derinkuyu. 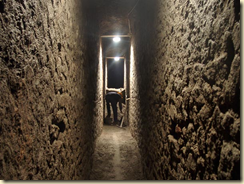 Of all of the underground cities found in Turkey, the Derinkuyu underground city is the largest. It is unknown exactly why the city was constructed. Archaeologists have found evidence that the city could be sealed off from the inside by means of a series of large stone doors. The stone doors are approximately one meter to a meter and a half in height. They are between 30 and 50 cms thick and weigh between 200 and 500kg. Each of the 11 floors in the city could also be closed off independently of one another. The city was large enough to comfortably house between 35,000 and 50,000 people. The complex contains wine presses, oil presses, storage rooms, refectories, chapels and even stables. It is believed that the city was built between the 8th and 7th centuries BCE. The people that were believed to have built the underground city were known as the Phrygians. The kingdom of Phrygia was located the west central part of Anatolia. This is part of modern-day Turkey. The Phrygian kingdom was attacked by many enemies. In approximately 690 BCE they were overwhelmed by Cimmerian invaders from Iran and were also conquered by invaders from the kingdom of Lydia. It finally became part of the Roman Empire and all traces of its language had vanished by the 7th century CE. The Phrygians had a fairly advanced culture for the Bronze Age. Their music influenced some styles of Ancient Greek music and Midas, the king with the golden touch was mentioned as being a Phrygian. Some of the musical instruments that were used to play ancient music were also created b y the Phrygians. It is unknown why Derinkuyu was created. The huge stone doors and access to water may have meant that it was designed to be a stronghold should the Phrygians be attacked. The presence of churches and other religious buildings also suggested that the complex may have been used for religious purposes. Only about ten percent of the stronghold has been excavated and so scientists are still learning more about the structure as they go along. It is believed that while the city may have been started in the 8th to 7th centuries BCE it may have been expanded and enlarged during the Byzantine era. There is some evidence that suggests this work may have been performed during the 5th and 10th centuries CE. This was a time when the city was used more frequently as a means of taking refuge and for religious purposes. 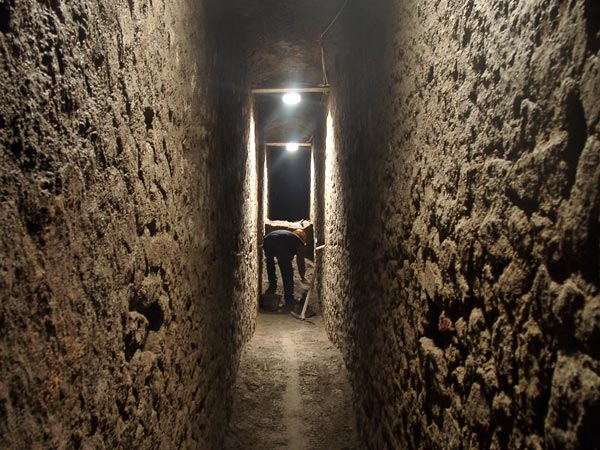 Derinkuyu is only one of several underground cities that have been unearthed in Turkey. Many are located in the same province as Derinkuyu. 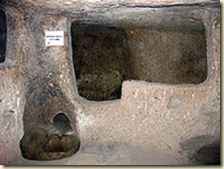 It is believed that these other underground structures may have been created by ancient Christians as a place where they could retreat to in order to escape being persecuted. 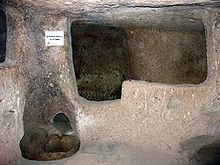 Derinkuyu is actually connected to some of these other underground cities through a series of tunnels. Theseus was almost to Athens. He had been travelling around the Saronic Gulf instead of taking the easier method of traveling by boat. His partially divine nature had given him the ability to defeat many of the bandits and monsters that he encountered along the way. He had avoided being torn in two by Sinis, beaten with a club by Periphetes and had managed to kill an enormous pig that had been killing other travelers. He had also avoided being tossed off a cliff near the town of Megara. He still had a ways to go, however, before he could reach the city and claim his birthright as one of Aegeus’ sons. He still had two more enemies to defeat before he could reach Athens and meet his father. At Eleusis, an important religious site and the location of the Eleusinian Mysteries Theseus met up with King Cercyon. Cercyon was extremely strong. Some legends say that he was also a son of Poseidon, the Greek god of the sea. Other legends state that he was the son of Branchus and the grandson of Apollo. Cercyon challenged Theseus to a wrestling match. In the past, Cercyon had always managed to defeat his opponents and would kill them after he had defeated them. But he had met his match in Theseus. 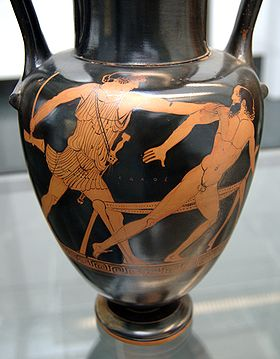 Instead of being defeated and slain, Theseus was able to defeat Cercyon and killed him after the wrestling match was over. After defeating Cercyon at Eleusis, Theseus continued along the route to Athens. He met the final enemy that he would have to defeat on the plain of Eleusis. His final battle was with Procrustes. Procrustes was also known as “The Stretcher”. Procrustes was a rather nasty man. He would force passers-by to lay down in an iron bed. He would then measure them against the bed. If they were too tall for it he would cut off their legs. If they were too short to fit in the bed he would stretch them out until they fit. Of course, nobody ever fit the bed. This was because Procrustes actually had two beds. One was shorter and one was longer. Nobody would ever fit the beds. 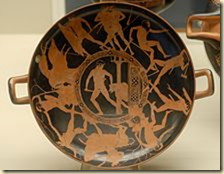 Theseus defeated Procrustes and forced him to lie down in his own bed. When Procrustes did not fit, Theseus cut off his legs and then decapitated him using Procrustes’ own axe. 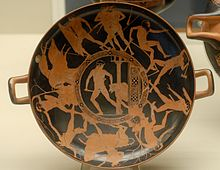 With these enemies defeated, Theseus could continue on to Athens and meet up with his father, Aegeus. Instead of immediately announcing his parentage Theseus decided to lay low. His father was suspicious of who this powerful young stranger was. Aegeus’ wife Medea recognized him and was not happy that he was there. She worried that Aegeus’ son would supplant her own son as ruler of the kingdom. Medea decided that she wanted Theseus to be killed. She set him the task of capturing the Marathonian Bull. She thought that he would likely die in the attempt and she would no longer have to worry about him taking the throne away from her son Medus. Theseus left on this task and Medea thought she could sit back and relax. But could she? Tomorrow: What really happened with Theseus and the Marathonian Bull.